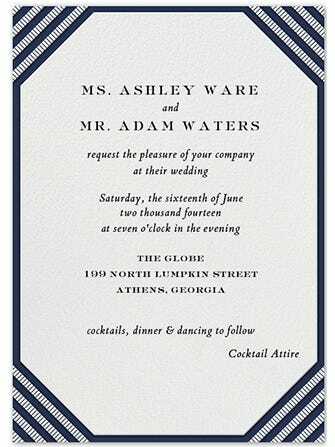 What is the proper way to write invitations? How formal does the language really need to be? I’ve been told that it depends on who is paying for the wedding, but that feels a little old fashioned. In terms of the actual wording, almost everything is dictated by who is hosting the wedding. What does “hosting” mean exactly? Well, traditionally it means whoever is paying for the event. The most old school way of handling wedding payment is to have the groom’s parents pay for or “host” the rehearsal dinner while the bride’s parents tackle the wedding and reception. These days, it’s not so simple — there are typically many hands (and wallets) involved. Sometimes if one set of parents is far more affluent, they’ll have a heavier financial role in the weekend. Other times, the married couple-to-be might need (or want) to handle the wedding payments themselves. With all this in mind, it is very important to get the language just right on the invitation. What could be worse than slighting the future in-laws when they are the ones who are paying the bills? There are all kinds of nuances worth noting. For example, did you know that you should only say that you are requesting the “pleasure” of someone’s company only if wedding venue is secular? Religious venues typically use the “honor” of someone’s attendance. With so many nitty-gritty specifics, we’re breaking down the three most common hosting scenarios and showing you how to word your invitation the right way. Click through to see the examples! If the bride’s parents are paying for the wedding, opt for this formula. Photo: Courtesy of Paperless Post/Alimay Events. 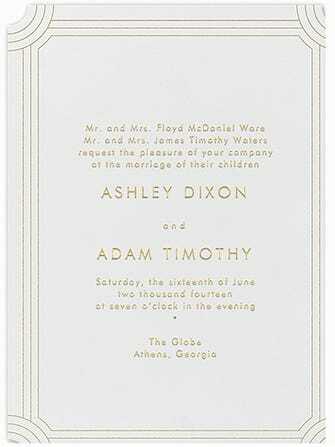 When both sets of parents equally host the wedding and reception, use this wording. When the bride and groom themselves are hosting the wedding, stick with this verbiage. We’d love to hear your questions! Drop us a line at DearAlimay@AlimayEvents.com.